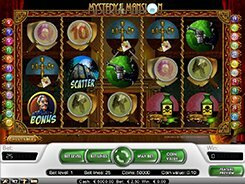 This is a NetEnt-powered witch-themed slot equipped with 5 reels and 20 paylines. 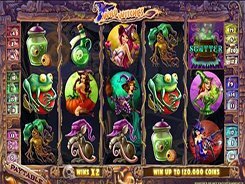 On the reels you will come across various witches (mid to high paying symbols) as well as toads, mandragora roots, eyeballs floating in a liquid-filled container, and other witch accessories (low-pay symbols). 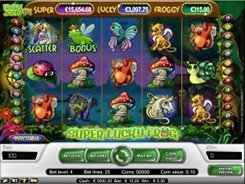 By adjusting a coin value ($0.01 to $1), the number of coins (1 to 4) and the number of active lines, you can place a bet ranging from $0.01 to $80 per spin. 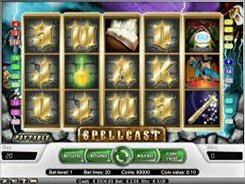 The slot features two wild symbols; a regular wild depicted by an opened spell book substitutes for other symbols and doubles payouts, while a so called Witchy Wild (that same book but with golden accents on it) appears on reel 3 only and quadruples payouts when substituting. A regular wild is the biggest payer in the game awarding $40,000 for five of a kind. 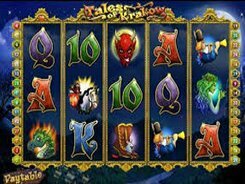 The Boiling Cauldron is a scatter that unlocks 10 to 30 free games with all wins tripled, once these three or more appear on the reels. 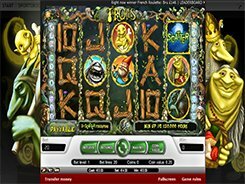 Besides, five scatters pay out x500 times a total bet (a cash equivalent of $40,000 on the max bet).